The Elmhurst History Museum offers a free, family-friendly event later this month called Spring Break History Hunt. It takes place on Wednesday, March 27, 2019 from 11 a.m. to 3 p.m. at the Churchville One-Room Schoolhouse and Fischer Farm. Kids of all ages can engage in different activities in the beautiful old buildings and grounds to complete the scavenger hunt and win a prize. At Elmhurst Toyota, we appreciate the wealth of historical sites to explore so close to home. See history come alive at the Churchville Schoolhouse and Fischer Farm during the Spring Break History Hunt. The Churchville Schoolhouse is on the National Register of Historic Places. It was built around 1846 and is one of the few remaining one-room schoolhouses in Illinois that’s still on its original site. At Spring Break History Hunt, a 1910 schoolmarm presides over the classroom. 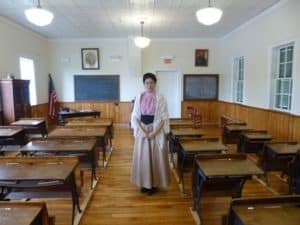 Your kids can participate in lessons from the early 20th century, play games from the period, and practice penmanship just as the children who lived around Elmhurst at the turn of the century did. Crafts will be offered while supplies last. By taking part in the activities, kids meet the requirements for the scavenger hunt. The next location for the History Hunt is Fischer Farm. Like the Churchville Schoolhouse, Fischer Farm shows what life was like for DuPage area families in the 19th and early 20th centuries. As they complete the History Hunt requirements, children can visit the farm animals and explore the grounds and wonderful old buildings. The Fischer family first built a cabin on the land sometime around 1838. Later, they added the barn and other farm outbuildings. The large family farmhouse was built in approximately 1920. Spring Break History Hunt is open to all ages. Children must be accompanied by a responsible adult. Prizes will be awarded to everyone who completes the entire scavenger hunt at both Fischer Farm and the Churchville Schoolhouse. You don’t have to register or sign up. Just come on over to the event in Bensenville to join in the fun! Visit www.ehmprograms@elmhurst.org or call 630-833-1457.